We present an algorithm that performs image-based queries within the domain of tree taxonomy. As such, it serves as an example relevant to many other potential applications within the field of biodiversity and photo-identification. Unsupervised matching results are produced through a chain of computer vision and image processing techniques, including segmentation and automatic shape matching. The matching itself is based on a nearest neighbours search in an appropriate feature space. Finally, we briefly report on our efforts to set up a webservice to allow the general public to perform such queries online. Pauwels, E.J.E.M, de Zeeuw, P.M, & Ranguelova, E.B. (2008). Computer-assisted tree taxonomy by automated image recognition. 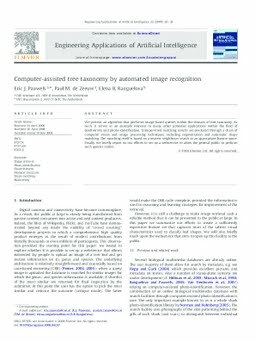 Engineering Applications of Artificial Intelligence, 22(1), 26–31.